The United Nations (UN) has pledged continued assistance to flood survivors until their lives normalise. UNAids Executive Director and UN Under- Secretary General, Michel Sidibe, said this on Friday, after visiting Bangula Evacuation Camp in Nsanje District. It transpired, during the visit, that people who are staying at the camp lack basic necessities. “We will try to help our friends affected by floods with items such as food but, much more, these people need support for them to return to their homes,” he said. Camp manager, Isaac Falekeza, said the situation was dire. “The last time we received aid is eight days ago,” he said. Health Minister Atupele Muluzi, who was part of the entourage, said the government was committed to addressing challenges which flood survivors are facing. “We understand that our friends affected by floods are facing a lot of challenges, but let me assure them that the government together with development partners partners will do is best to address health-related and other challenges,” he said. On the day, United Nations High Commissioner for Refugees donated blankets and mats while Care international donated food items to people at the camp. 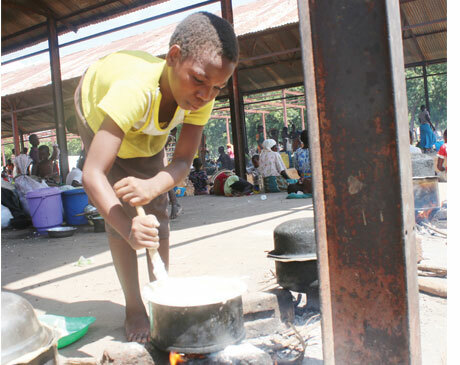 Bangula Camp has 5,000 people from Nsanje District and neighbouring Mozambique. The people are part of the 868,895 that have been affected by heavy rains which hit parts of the Central and Southern regions of the country.